A deadly vortex randomly appeared one day and completely destroyed the friendly town of Hicksville. Emergency aid was distributed to the displaced victims of the vortex, but after two hundred and seventy three years with the vortex still at category five storm strength, the town has since been abandoned. 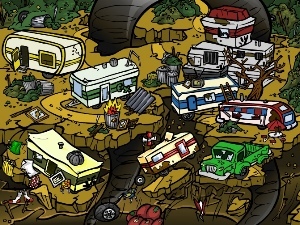 All that is left is a temporary trailer park filled with poverty, trash, crime and violence. 6 new Photos are now avaliable for your Photo Albums. There are 2 new Fasoro and 2 new Zoosh pet colours avaliable. New limited edition Account Upgrade Items have been released. These Mordo Potions will get you a limited edition Mordo pet and the new Certificates will rename your pet. These are very limited and only a specific number will be sold. AU RETIRE WARNING - When we release the March Account Upgrades next month, these items and the March, April, July, August, September and October Account Upgrades will ALL RETIRE. They will no longer be on sale in March. This is your last chance to get hold of a Mordo, Nino, Sindi and the Fugunzel/Explorer Treasure Maps for a long, long time. A new Trailer Costume is about to be released. These are the first 4 pets that can wear it! A new shop has opened in Minipet Island. The shop restocks Seeds which you will soon be able to plant in the Garden of your Marapet Houses. Each seed pack could grow into a rare Organic Minipet! The new January Account Upgrades have been released! There are 2 different themes - Vortex and Space Fairy! We have also added Canadian SMS Account Upgrade payment options. Thanks for supporting Marapets. The Vortex themed Account Upgrade has the following items. There is also a 1 in 3 chance that you will get a limited edition Ercuw pet potion instead of Paffuto! The Space Fairy themed Account Upgrade has the following items. There is also a 1 in 3 chance that you will get a limited edition Ercuw pet potion instead of Feliz! The Lottery has been drawn for this week. nate1000 is the winner of the 178,300MP Jackpot with the winning numbers of 11, 10, 20, 25, 15 and 14! Congratulations! Last Week's Raffle has now ended. Blackpony09 is the winner of the Red DNA and 100,000MP prize with the winning raffle ticket number 1947! Congratulations! Make sure you buy your tickets for today's raffle - only 10MP per ticket! Thank you all for your patience the last few weeks as we ran a very unreliable, unstable and limited service on the site. Our essential maintenance has been completed now and its the last big change we will be making on the site for a very long time. It was a complete success and you should already see the results on the site. A few months ago, we had lots of maintenance to reprogram the site and change the database and software that runs Marapets and that was a success - but only while our hardware and servers worked. These were getting old and outdated, so we invested a lot of time, money and effort improving and upgrading all of the hardware and the network that keeps Marapets online. We are now faster, more reliable and because no more changes will be made, I can start to fix the bugs on the site and keep them fixed. Thank you for your patience. We are now fixing any of the minor errors around the site and will start releasing new content and features - including a brand new world next month! The Lottery has been drawn for this week. mkpoliks is the winner of the 328,500MP Jackpot with the winning numbers of 7, 4, 3, 2, 1 and 24! Congratulations! Last Week's Raffle has now ended. ROBOFLOBO219299 is the winner of the Red DNA and 100,000MP prize with the winning raffle ticket number 21135! Congratulations! Make sure you buy your tickets for today's raffle - only 10MP per ticket! The Lottery has been drawn for this week. marajackr is the winner of the 420,000MP Jackpot with the winning numbers of 8, 2, 17, 24, 19 and 3! Congratulations! Last Week's Raffle has now ended. cheese98 is the winner of the Red DNA and 100,000MP prize with the winning raffle ticket number 9802! Congratulations! Make sure you buy your tickets for today's raffle - only 10MP per ticket! The Lottery has been drawn for this week. daisydare is the winner of the 642,800MP Jackpot with the winning numbers of 3, 1, 18, 14, 9 and 21! Congratulations! Last Week's Raffle has now ended. hallowinmad is the winner of the Red DNA and 100,000MP prize with the winning raffle ticket number 16526! Congratulations! Make sure you buy your tickets for today's raffle - only 10MP per ticket! The Lottery has been drawn for this week. rebeccamae is the winner of the 648,800MP Jackpot with the winning numbers of 2, 23, 14, 9, 18 and 10! Congratulations! Last Week's Raffle has now ended. piggy333 is the winner of the Red DNA and 100,000MP prize with the winning raffle ticket number 1228! Congratulations! Make sure you buy your tickets for today's raffle - only 10MP per ticket! The new December Account Upgrades have been released! There are 2 different themes - Gingerbread and Snowman! The Gingerbread themed Account Upgrade has the following items..
Christmas is on the way, and some seasonal pet colours have been released. The Lottery has been drawn for this week. shadowman9 is the winner of the 869,300MP Jackpot with the winning numbers of 1, 10, 15, 5, 20 and 25! Congratulations! Last Week's Raffle has now ended. princesszahra is the winner of the Red DNA and 100,000MP prize with the winning raffle ticket number 13015! Congratulations! Make sure you buy your tickets for today's raffle - only 10MP per ticket! These 4 Ice and 4 Snow pets have just been released. These 4 Gold and 4 Bronze pets have just been released. The Lottery has been drawn for this week. kelsarah is the winner of the 1,309,400MP Jackpot with the winning numbers of 1, 3, 4, 5, 6 and 7! Congratulations! Last Week's Raffle has now ended. chacha9 is the winner of the Red DNA and 100,000MP prize with the winning raffle ticket number 4400! Congratulations! Make sure you buy your tickets for today's raffle - only 10MP per ticket! As some of you have already noticed, our Christmas Elf is back in Marada this year! Elves get very excited about the holiday season and whenever the advent newths are working well and she has some time to spare the head elf loves to wander around Marada looking for signs of festive spirit and giving out presents to random members. Look out for her on the forums (her account name is Elf) - if you have a festive doll, siggy, or avatar then you might get lucky! As well as random small presents there will be giveaways in the news for rare items and some very festive LE pets. Over the next couple of days 100 potions will be given away to random members whose doll is wearing a festive costume or outfit! There are seasonal, christmas, snowy, and elf potions to be won and you dont need to have one of the character costumes, you can make up your own outfit with red and green clothes, or perhaps go for a snowy or icy winter look - be creative! Lastly, although our christmas giveaways are largely forum based, don't worry if you have an under 13s account and cant use them - for every giveaway there will be some of the same prizes given out randomly to our younger members who we find online too. Its that time of year again when things are afoot in Biala! We've had our elves standing over the advent newths bribing them with fresh fish to make sure they work hard and as a result we are pleased to announce that the Advent Calendar is now open! You can visit the calendar once a day all through December to claim a free gift - it could be an advent item, some mp, or another prize. The prize changes every day, so make sure you don't miss out! Please remember that you are only allowed ONE account on marapets! We have a zero-tolerance policy on advent cheating and anyone caught using more than one account to collect advent prizes will have ALL their accounts banned immediately with no hope of getting them back. This includes accounts made for imaginary brothers and sisters and pet dogs etc. If more than one member of your family genuinely plays marapets then it is fine for you all to use the advent calendar, but you shouldn't give the prizes to each other. The Lottery has been drawn for this week. zack1992 is the winner of the 700,900MP Jackpot with the winning numbers of 20, 12, 3, 15, 4 and 2! Congratulations! Last Week's Raffle has now ended. catninja909 is the winner of the Red DNA and 100,000MP prize with the winning raffle ticket number 11385! Congratulations! Make sure you buy your tickets for today's raffle - only 10MP per ticket! The Lottery has been drawn for this week. TonyMohawk is the winner of the 907,600MP Jackpot with the winning numbers of 23, 24, 2, 5, 6 and 14! Congratulations! Last Week's Raffle has now ended. kizmister is the winner of the Red DNA and 100,000MP prize with the winning raffle ticket number 25689! Congratulations! Make sure you buy your tickets for today's raffle - only 10MP per ticket! The Lottery has been drawn for this week. Hippyi is the winner of the 1,402,600MP Jackpot with the winning numbers of 1, 21, 22, 18, 17 and 7! Congratulations! Last Week's Raffle has now ended. brooke2012 is the winner of the Red DNA and 100,000MP prize with the winning raffle ticket number 1263! Congratulations! Make sure you buy your tickets for today's raffle - only 10MP per ticket! A new Pumpkin Hunt has just started for 2008! It will last 3 weeks. As you browse and play the site as normal, check out every page for a Pumpkin in a box. When you find it, click it and you'll get a prize! The 250 different players who collect the most pumpkins will receive 1,000,000MP and a limited edition Hot Dog Trading Card! The next 250 will just get a Hot Dog Trading Card. 25 lucky players who have collected more than 100 pumpkins will also be randomly selected to win a retired Halloween Costume!